1) Do you take credit cards? What are your payment methods? Vita does not accept credit cards. Available terms are Net 30 for qualifying customers (3 credit references and a bank reference required to be submitted for review & approval) COD or prepay (via check or wire transfer in US Dollars). We do not accept credit cards in order to keep our costs low (due to fees charged on credit card transactions) which in turn keep prices low to our customers. 2) Do you charge sales tax? Vita Needle charges sales tax in MA for orders shipping to that state. If you qualify for tax exempt status, please submit your certificate with your initial order and we will remove the tax charge from your order. 3) What are "random lengths" (R/L)? Random lengths are lengths of tubing or wire stock not necessarily cut and deburred on the ends, with fairly wide length tolerances. The standard length tolerance for random length tubing or wire is ± 3". Tube ends may be crimped or cut on an abrasive saw with some burrs remaining. Random length tubing is sold with the understanding that the customer will be further processing the material into components or parts, thus the extra effort and cost to deburr all ends is not incurred. 5' or 10' random lengths are standard in the tubing and wire industries. 4) Do you cut to specific lengths? Vita Needle can cut and deburr tubing and wire to custom lengths and tolerances provided by the customer. For raw material only, Vita typically sells in 5 or 10' random lengths. Other "as cut" lengths are available by customer request for lengths 12" or greater. As cut means that the tubes or wires will be cut to the approximate specified length, but may have burrs present on the ends of the tubes/wires. Lengths shorter than 12" are only offered as cut and deburred, which means that all burrs are removed from the tube or wire ends. 5) Are you a distributor? Vita Needle is both a manufacturer and distributor of stock and custom products. Vita Needle manufactures the vast majority of its' raw material. This vertical integration saves customers substantial dollars and time relative to other companies. 6) Can I receive original mill certifications? Due to confidentiality agreements with mills that allow us to obtain steeply discounted pricing on raw material in return for not having to handle end user inquiries, original mill certifications are not available. Vita maintains all historical records for complete traceability and the certification data is directly copied from the mill certifications. 7) What are the dimensions of your adapters and syringes? Can you provide engineering drawings of these products? Please contact our sales department for questions on specific products. Because manufacturing tolerances and methods are proprietary, complete engineering drawings for these products are not available. 8) Can I request a sample? Vita Needle maintains one of the lowest minimum order requirements in the industry. With these low minimums, obtaining small quantity test pieces/products for a project is affordable for almost anyone. 9) Can you ship COD to Canada? Shipping carriers that Vita partners with, such as Fedex and UPS, do not permit COD shipments to Canada. 10) Do you manufacture DFARS compliant products? 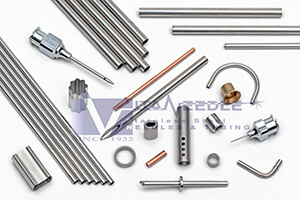 Yes, Vita Needle manufactures DFARS compliant tubing, wire and other products. Please advise your sales representative when submitting your request for quote that this requirement is necessary. 11) What quality standards are Vita Needle certified to? Are you ISO compliant? Vita Needle is FDA charter registered (we’ve been making needles long before the FDA was formed in 1972), and also ISO 9001: 2015 and ISO 13485: 2016 certified. Copies of our certificates are available under the Media Gallery of this webpage. 12) What is the typical tensile strength on tubing supplied by Vita Needle? Tensile strength varies widely depending on factors such as the type of material and OD / average wall thickness. Standards also vary widely among manufacturers and distributors. Tensile strength is driven largely by the amount of cold work applied to tubing which varies depending on process limitations and other constraints (such as tolerances). Typically, hard temper tubing has a minimum tensile strength of 135 KPSI, however if you have specific requirements for tensile strength, please advise your sales representative when placing a request for quotation. We can manufacture tubing to custom tensile requirements and ranges if not readily available in inventory.